For more than 50 years, Graphic Design USA (GDUSA) has been a trusted source of news and insights for graphic design professionals, as well as source of recognition for design in several national design competitions that culminate in Annuals showcasing the best in Graphic Design. With the selection of our branding and packaging work for Aura in their 2016 American Package Design Awards, Creative Tonic is proud to be recognized in this elite group of design leaders. The outstanding work recognized – from 200 elite design firms, design departments and production companies – is testimony to the power of package design in advancing brands and influencing the purchasing decision. Playing off the spiritual side of the Aura name, the bright watercolor approach creates a bold, free-flowing “essence” for the brand. 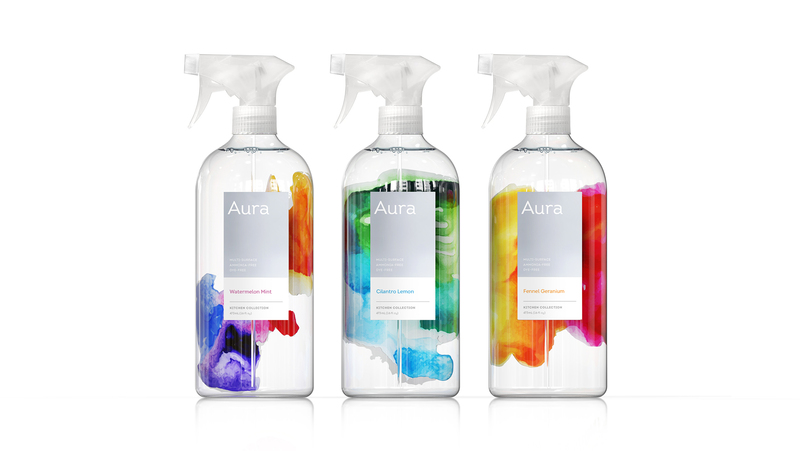 From the vivid, organic patterns to the clean, modern typography and metallic label detail, this concept is both trendy and refined, delivering a strong shelf presence and unique style for the household cleaner market. The American Package Design Award annual competition celebrates attractive graphics, of course, but more importantly the power of design to forge an emotional link with the buyer at the moment of truth. Makers, sellers and marketers are challenged as never before to convey the message, promote the brand, close the deal. Think fragmented audiences, information overload, media clutter, global competition, economic dislocation, changing practices and preferences. Package design and related disciplines are increasingly the difference makers in advancing the brand and influencing the purchasing decision.